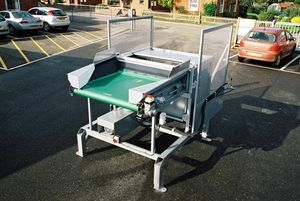 Stainless steel is the usual standard for the manufacturer of crate tippers. Normally used in hygeine areas working with plastic crates or bins the Tong Peal crate tpper meets all legislative standards. Ideal for emptying crates of cualiflower florets, brussel sprouts, potatoes, etc. Fully automatic operation with manual over-ride buttons in electric panel door or hand held pendant.